On Wednesday the 16th we drove out to view two more lighthouses. This will make a total of seven lighthouses so far, and will the last two for a little while. 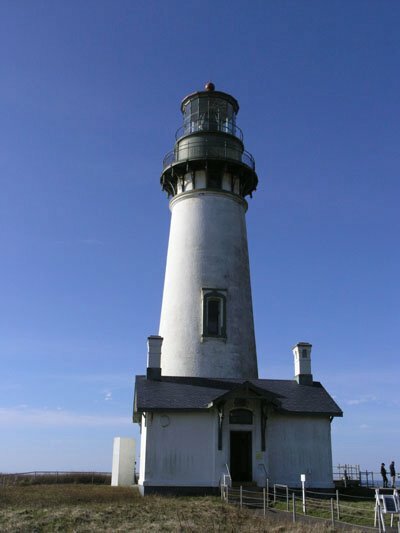 We drove south and came first to the Coquille River Lighthouse. This lighthouse was commissioned in 1896 to guide mariners across a dangerous bar. Decommissioned in 1939, restored in 1979 as an interpretive center. The 40-foot octagonal tower hosts a solar powered light. 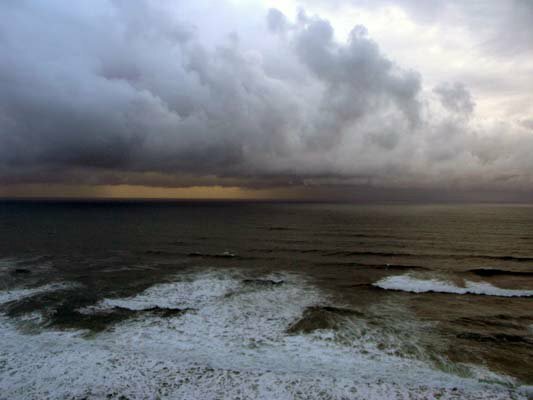 The view from this lighthouse is, of course, amazing. The beach holds a multitude of pretty rocks and petrified wood. 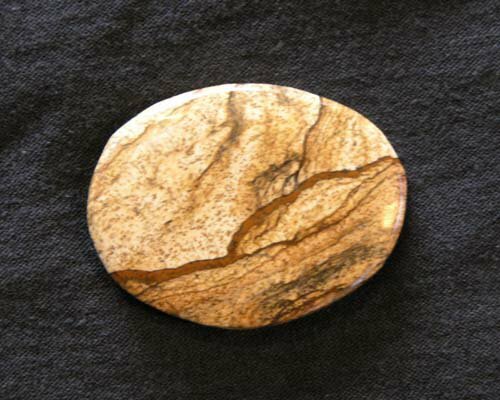 I was lucky enough to run into a couple of ladies that were beachcombing who showed me what petrified wood looked like in the rough. 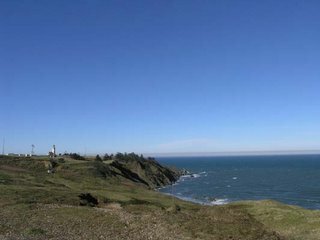 Our next destination was Cape Blanco and it’s lighthouse. When we tried to get out of the truck at this lighthouse, the wind was so strong that it almost ripped the down out of Bill’s hands. It was crazy; I got blown around a bit…literally! 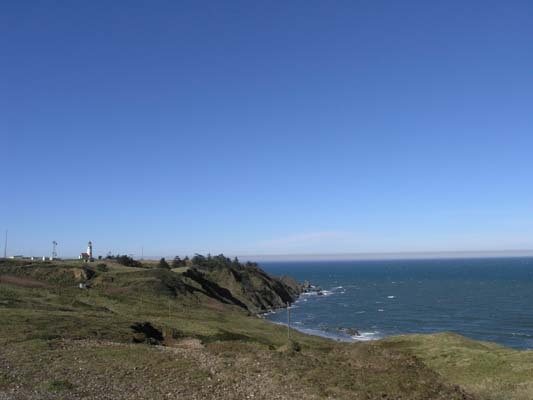 This lighthouse sits on Oregon’s westernmost point 9 miles north of Port Orford. Commissioned in 1870, its cliff top location is 245 feet above the ocean and it’s tower rises 59 feet. 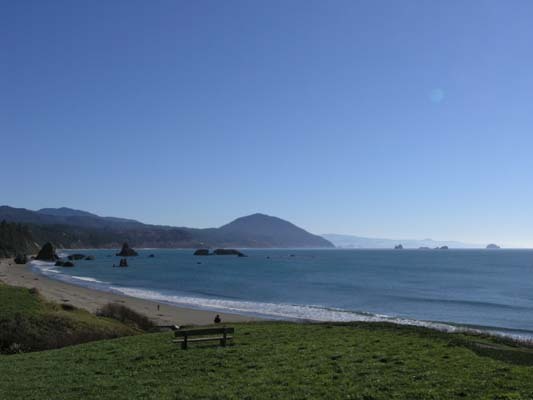 After getting blown over at Cape Blanco, we continued south into Port Orford. We were both hungry and just couldn’t pass up having lunch at The Crazy Norwegian’s Fish and Chips. I bought a sweatshirt…couldn’t help myself. They have really good food; stop by if you’re in the area. After lunch we drove a half block down and parked at a look out/beach area, it was beautiful! That’s it for our lighthouses for now. 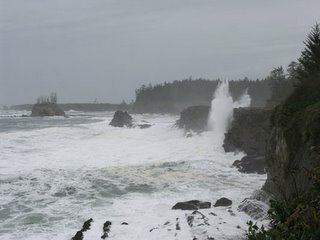 We left the coast on Sunday and drove the 5 hours to the Portland area. We set up in the park we stayed in before left the area in the first place but weren’t really happy with it this time around so we moved on Monday to another park in the area and really like it here. We will be in this area at least through Thanksgiving, maybe longer, but we’ll have to wait and see what happens. 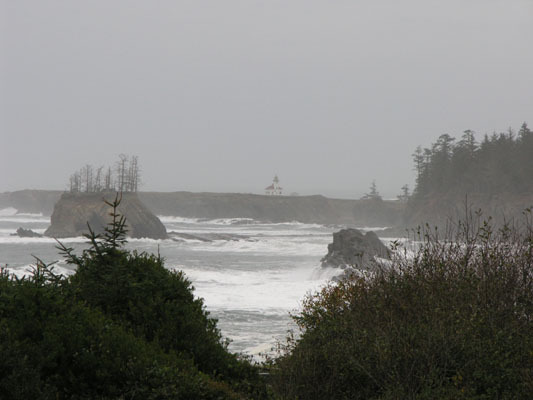 On the 9th we drove about 10 min north of where we are staying to see the Umpqua River Lighthouse at Winchester Bay. I’ve noticed that a lot of the Oregon Lighthouses have a similar structure and some of them look exactly the same. An earlier structure, commissioned on the north spit of the river in 1857, was the first lighthouse sited on the Oregon coast. It fell into the river in 1861 due to sand erosion. The current structure has a 65-foot tower and sits 165 feet above sea level. 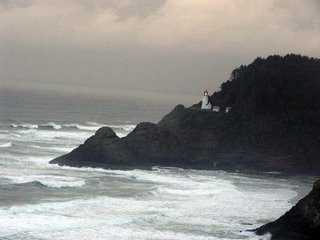 It is identical to the Heceta Head Lighthouse and was also illuminated in 1894. The lens emits red and white automated flashes. 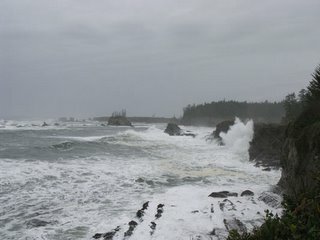 On the 12th we drove the Cape Arago highway and stopped at a lookout that you can view the Cape Arago Lighthouse from. This lighthouse isn’t open to the public, so you can’t get very close. 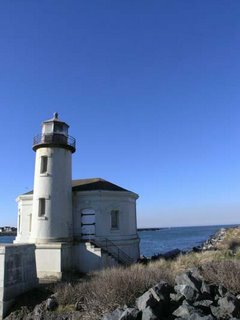 This lighthouse stands 100 feet above the ocean on an islet just off Geoffrey Point, and is equipped with a 44-foot tower illuminated in 1934. 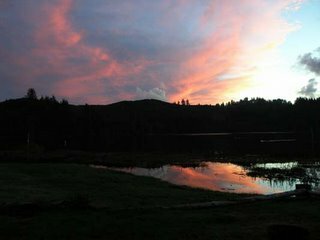 It’s the newest in terms of service, earlier structures were built on this site in 1866 and 1908, both succumbing to weather and erosion. This lighthouse also has a unique foghorn. The ocean was rough this day and there was a lot of sea spray in the air. 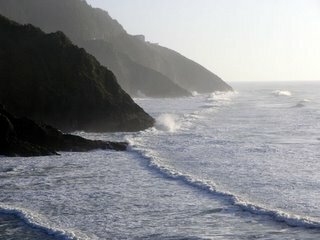 We sat and just watched the waves crash on the cliff, over and over again the waves would crash higher than the cliff. It was really something to see and hear. Just after you’d see the wave crash, you’d hear it. Stay tuned for more lighthouses. Tuesday, November 8th, Bill and I drove up to Newport, OR and worked out way back down to see some lighthouses. We had planned on seeing five that day, but only made it to 3. The first on we saw was the Yaquina (yah-KWIH-nah) Head Lighthouse. 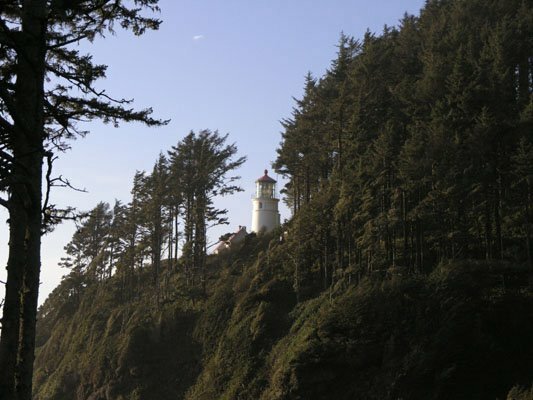 This lighthouse has a 93-foot-high tower and is the tallest on the Oregon coast; it stands 162 feet above sea level. This lighthouse was illuminated in 1873. It has 103 steps up to the watchtower, and an addition 6 to the lens. Bill and climbed all 103 steps, going up was the easy part, coming down was a lesson in vertigo and I was glad there were hand rails on both sides of the spiral staircase. The view from Yaquina Head is amazing, but what view isn’t from the Southern Oregon Coast? 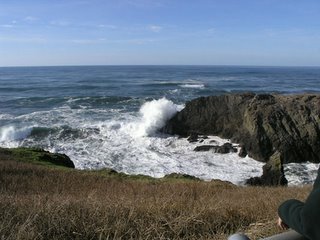 At Yaquina Head they have an interpretive center that is very informative as well as tide pools that you can walk down to. They’ve gone to lengths to not just preserve these tide pools but to make them accessible to people in such a manner that the people don’t disturb the natural environment. The tide was coming in when we were there (which buries the tide pools in several feet of water) so we skipped that adventure, but I’m sure we’ll get back someday. 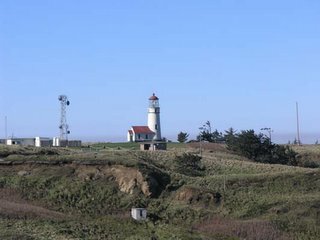 The next lighthouse we saw was Yaquina Bay lighthouse also in Newport, OR. 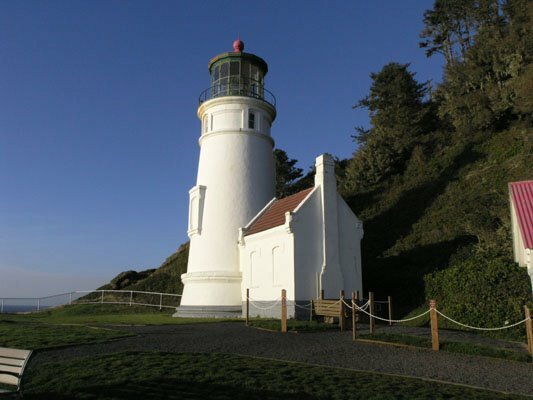 This is the second oldest standing lighthouse structure on the Oregon coast. In original service from 1871 to 1874 and only served until the commissioning of the Yaquina Head Lighthouse. 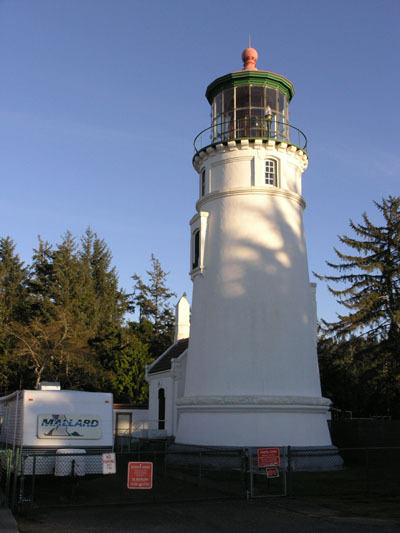 It was re-lit in 1996 by the U.S. Coast Guard and recognized as a privately maintained aid to navigation. The lens is 42 feet above ground and 161 feet above sea level. Our next stop took us back to the Heceta (ha-SEA-ta) Head Lighthouse, but this time we walked the ½ mile up the lighthouse. This lighthouse wasn’t open to the public during the time we were there. They close up for the off- season, so we didn’t get to tour the lighthouse. 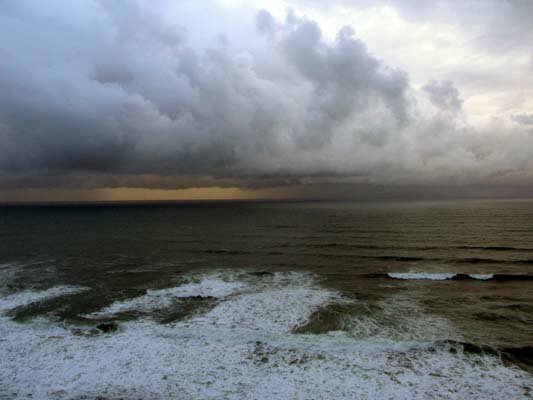 The view from the lighthouse is of course…amazing. The walk up to the lighthouse really provides some wonderful photo opportunities. Heceta Head Lighthouse sits 205 feet above the ocean. Light at top of 56-foot tower was illuminated in 1894; automated beacon, seen 21miles from land, rated as the strongest light on the Oregon coast. 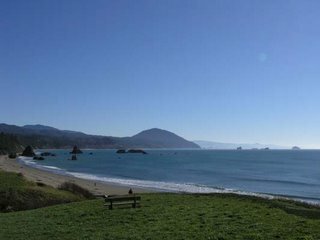 We’ve really been enjoying the Southern Oregon coast on the days that it isn’t raining. 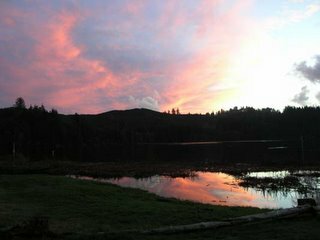 We’ve had a fair amount of rain and wind out here, but we are still enjoying this area. 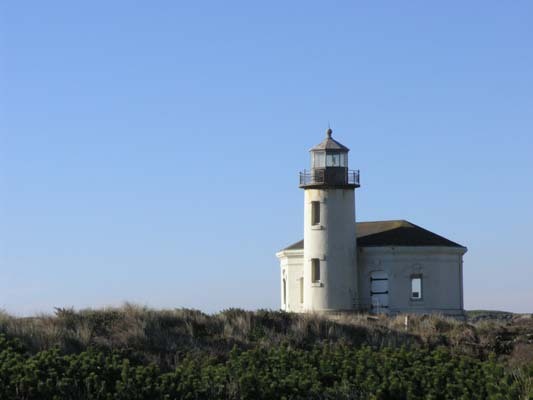 PS – Stay tuned for more lighthouses! On Monday the 7th we looked out our window at sunset and this is what we saw. 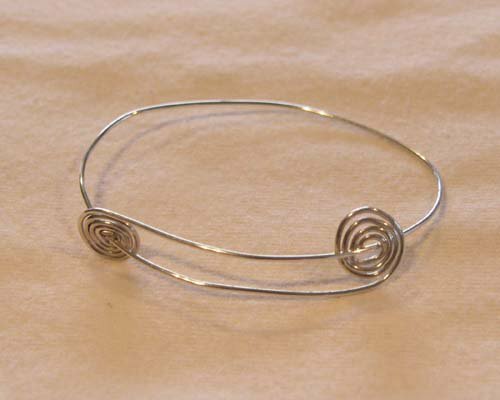 My latest venture has been in learning to make wire wrap and wire sculptured jewelry. So far I think I’ve done pretty well. I’ve only made a few pieces so far but they have all turned out extremely well, if I do say so myself. 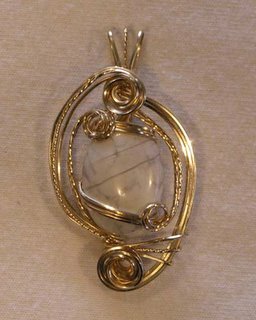 Well, I’m not the only one who says it, I’ve talked to a few shops and galleries on the coast about selling my pieces and they all are amazed at how well my first tries turned out. I already have three shops interested and I’m hoping to get an online store in the not-too-distant future. So here they are, my first four creations, two bracelets and two pendants. 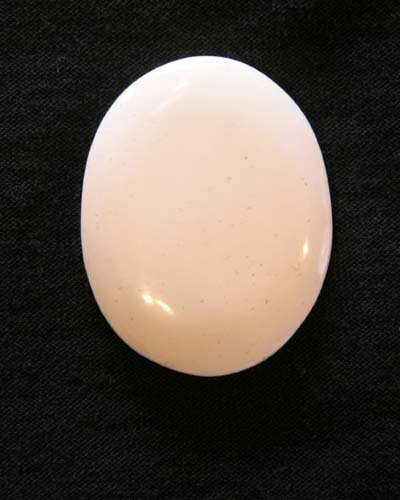 The white stone is Howlite and the red stone is Carnelian. They are both wrapped in 14K Gold Fill wire. Gold Fill has about 100 times more gold than gold plate, but is not solid gold. Gold Fill won’t chip or wear through in this lifetime, or the next for that matter, and will wear just as beautifully as solid 14K. Creating pieces in Gold Fill makes it affordable for everyone as solid gold wire is currently selling for around $50/ft. To give an idea, the Howlite pendant has almost 8ft of wire in it and the Carnelian pendant has almost 5ft of wire in it. The bangled bracelet (with the clasp) has a sterling silver patterned wire in the center and is bordered by 14K Gold Fill wire. The hook is sterling silver as well. 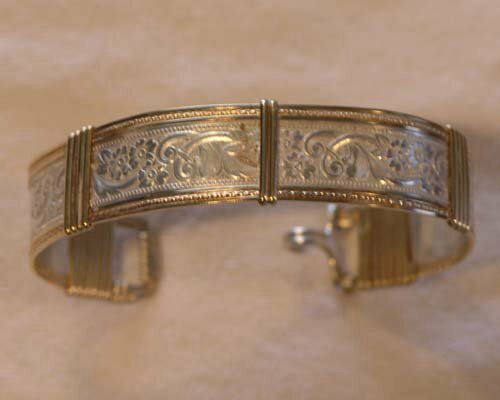 The ‘Elephant Hair’ bracelet is sterling silver. I’ve also just started learning how to cut my own Cabochons (style of cut stone). The awesome people at Usrey’s Rock Bin on Hwy 101 North of Coos Bay, OR are teaching me. They don’t have a website, but if you get to this area, stop in…they’re great. Here are some really crappy pictures of the work I’ve done on Cabochon cutting so far. The oval blue stone is Lapis, the teardrop light blue stone is Amazonite (a piece that Bill and I mined ourselves in NC), the white stone is Howlite, and the other stone is Picture Jasper. I’ve had a lot fun learning how to do this and once I can afford the machines I might just buy them, it’s really a lot of fun and messy to boot. Any chance I have being messy…I’m there! So that’s it for this time around. 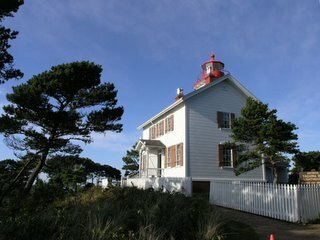 Bill and I went lighthouse viewing yesterday, but you’ll have to wait until I get the pictures sorted to hear about it. 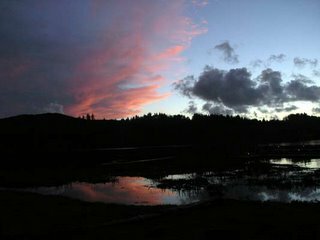 On November 2nd, Bill and I drove up to Yachats, OR to take in some views and check out some parks. Mostly it was to just get out of the RV. We’ve been having some pretty nasty wind and rain for the last 10-14 days or so…straight….non-stop. We experienced wind gusts up to 40-50mph. Let me just tell you how much a lightweight RV gets knocked around in that kind of wind, we’re lucky we’re still upright. 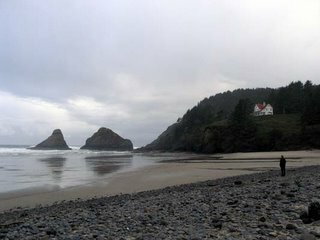 On our drive back we stopped at the Heceta Head Lighthouse. It’s a half-mile hike to the lighthouse that we didn’t do that day because it was cold, windy, and the storm was moving in. We did take some pictures though. 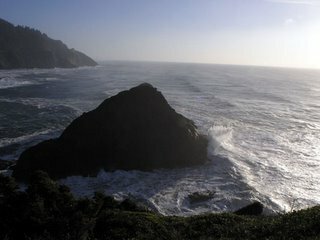 The southern Oregon coast is beautifully breathtaking. 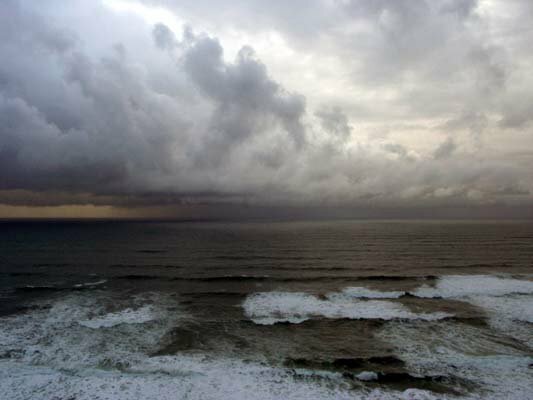 Storms and wicked weather just seem to add to the wildness and beauty of the place. There’s just no other place like it that I’ve ever seen, although, I’ve said that about most the places we’ve been. Watching the storm roll into Heceta Head was awesome; especially knowing that it was bringing heavy rains and Gale Force winds with it. Nothing like watching it come right atcha. We got knocked around for several days by that rain and wind. It’s seemed to calm a bit, at least for a day or two. 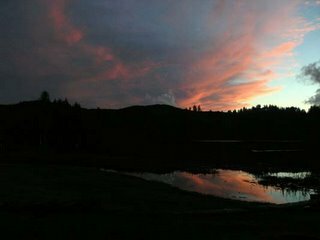 The lake we are on has risen significantly with all the rain. I hope that at least the winds still for a bit. Saturday I drove up to a yarn shop here in town and found a treasure chest of goodies for any of you who like that sort of thing. http://www.yarn-store.com/ The woman who runs this is a really cool lady, I had a blast looking around her store and chatting with her. Check out her website if you like yarn, knitting, crocheting…anything like that. Sunday I spent the day at the local rock/gem shop, run by a husband and wife duo. They are just awesome people. 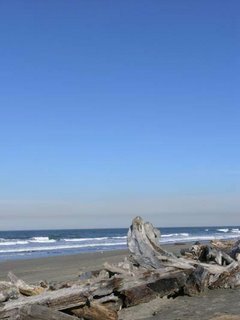 If you get down on the Southern Oregon Coast and you like beads, rocks, gems, jewelry, stop by their shop. Usrey’s Rock Bin on Hwy 101 in Lakeside, OR. 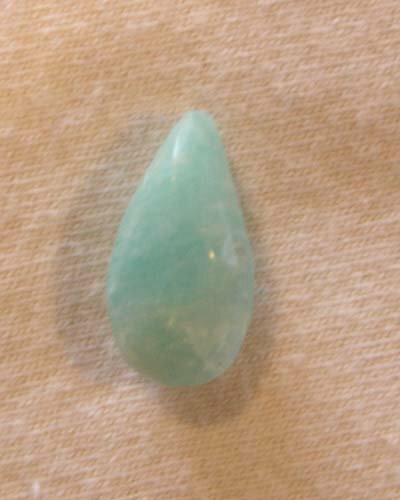 I spent the day there because Bill (the husband, not my Bill) was teaching me how to cut Cabochons. He said I did an awesome job, especially for my first time out. He let me keep the rocks I cut and I’m looking forward to making them into jewelry. That’s my latest venture for those who don’t know. 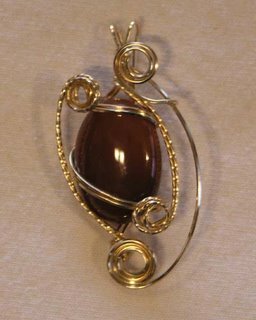 I’ve started making jewelry. 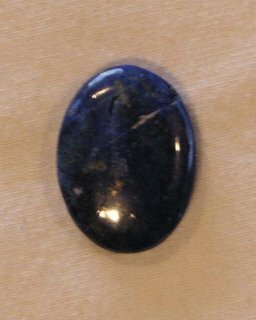 I’ll post pictures of both my stones that I cut and my jewelry in the next post. I’ve been trying to figure out the best way to photograph them, I might have to enlist Bill’s help.